So you want to get access to a website but unfortunately, the website you want to access is blocked and restricted. You are not allowed to access this website, You cannot see the content on that particular webpage. it is possible as it happens probably. It also happend with me last week. There are lots of reasons you may restricted from opening a website on the computer. In one case suppose that a website is blocked by the government of your country due to some reasons (as YouTube is blocked in Pakistan). Or let suppose you are In your workplace, you want to access a website, again you see a message such that “you are not allowed to see content of this website”. Same is the case if you are browsing internet in your college or school and want to access a website which is blocked then here in this post we are going to share a few ways making use of which will enable you to get these websites accessed and make it unblocked! Other people may suggest you any other method(s) because there are numerous method of accessing a blocked website but in this post we have taken the best and safest methods from them. Most of the people are implementing these and are getting access to the restricted websites. Now let have a look, what we are actually talking about. 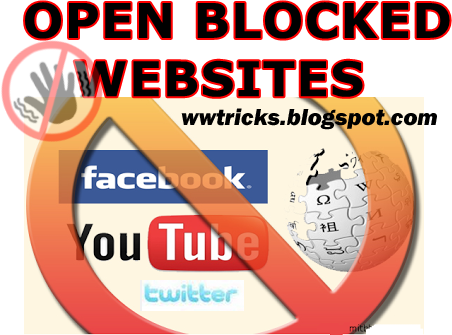 How you can open blocked websites on your computer. TOR is a browser having a feature to open and browse a website that is blocked in your country, workplace, school or college etc. so to get access, you will need to download the TOR browser from their website and then install on your computer so browsing within the TOR browser, you will be able to open any blocked website, whether it is YouTube, facebook, twitter, or any other website. Hola is a browser extension which has the ability to let your make access to a blocked website, the extension “Hola” is available for every major browser, so you don’t worry about it that can I use it on my browser? Hola extension can be downloaded for your browser as it is available for download on its own website. Here is another way to access blocked website, I think you may also be familiar with this method, most of people are using proxies sites to gain access to the website blocked. Below are some proxies that you can use. Note that using proxies websites you will unable to access social media networks because these are using cookies in order to keep you login, so in that case you should look to install the TOR browser on your computer or install Hola extension on your browser so you will capable of unblocking a block website to make access. As you know in pakistan, youtube is blocked but what if you have an urgent and important work for example you want to watch/download some tutorials or wnat to upload some videos to the youtube so in that cases you need to access youtube. Using one of the above three methods we mentioned, you will be able to do so or you can use unblockyoutube.pk to get access to youtube in pakistan. So dear readers! In today’s post we shared some best ways by which you will be capable of accessing blocked websites on your computer. Here one thing I would like to be clear that while using these tools, either browser, extension or websites, your browsing speed will definitely slow down. So it is recommended to uninstall remove that from your computer and from the browser in case you are using TOR browser or Hola extension to surf internet anonymously and get access to blocked websites. Comments are highly appreciated related to this post. Thanks for giving information.Through your Article,I chose proxy option and I unblocked my banned websites.Finally i checked my fake ip range using Ip-Details.com It's fully different from my previous ip range. I glad to hear from you & that our post helped you a little. Feel free to visit,read and comment on our blog posts because Tech Web World always appreciate your valuable comments...! Also please do share those posts on social networks which are helpful for you. Hi David, Thanks for being here and for your valuable comment. Keep visiting our blog to get new informative posts from us!